What should you do if a robot is underutilized, its range limit has been reached, space is no longer available, and using a second robot is simply not profitable? 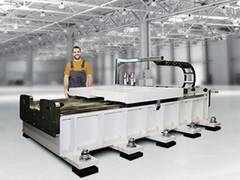 Robot transport units (RTUs) from IPR – Intelligente Peripherien für Roboter GmbH not only extend the action range of robots but also increase the efficiency of automated solutions. In this case study, an aluminum manufacturer wanted to use just one robot and a flexibly adaptable gripper unit to move differently sized steel sleeves weighing more than half a ton and stacked at different heights. To handle this task, bsAutomatisierung, the commissioned system integrator, placed the heavy-duty robot on an extremely robust transport unit from IPR. The robot becomes mobile, more versatile and ensures efficient processes at the loading station. 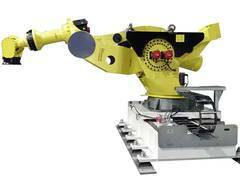 The Fanuc 6-axis robot M-2000iA is the largest and heaviest of its kind weighing close to nine tons and handling loads of up to 1.3 tons with an arm that extends almost four meters. It is used as the central component of an automated loading solution at a large manufacturer of basic aluminum products. Forklifts provide steel sleeves on special trolleys that are placed by the robot onto reels and then wound into aluminum coils ready for delivery. This sounds simple enough, but due to enormous weights of up to 1000 kg and different diameters of up to 650 mm, it is actually rather tricky. Until recently, the job had been performed by an employee using a manually operated lifting crane. The loading process took four to five minutes per sleeve and the company realized there was significant potential for optimization. bsAutomatisierung GmbH has its headquarters in Rosenfeld near Balingen, Germany, and was commissioned to develop an economical, easy-to-use robot solution. The company specializes in fast and precise loading and unloading of manufacturing machines. They offer customers complete automation solutions and systems as well as the associated engineering services including robot programming, control programming, electrical design and image processing. Using a flexible magnetic gripper unit, the robot needed to be able to handle any possible format as well as sleeves stacked differently based on their size and weight. To do that, a very precise sleeve measuring system had to be integrated. A complex algorithm was developed and programmed specially for the detection of presence, position and flatness. Still, it became apparent that the heavy-duty robot would have limitations in certain circumstances. Intelligent automation solutions are solutions that do not only meet the requirements effectively, but also efficiently with respect to utilized resources, technologies and costs. To ensure reliable handling of all load and storage cases defined in the requirements specification, the project partners had to decide whether fewer sleeves should be stacked on the trolley in certain cases, whether an even larger robot should be used, or whether an additional automation unit should be integrated. The last alternative was not feasible due to space limitations, so bsAutomatisierung found a third possibility: if the robot arm cannot reach the desired location, the entire robot must be moved. But how? “We were familiar with IPR as a manufacturer of robust robot transport units. We had heard about the competence of the company and the high quality of their products. After a first consultation, we got our other colleagues on board,” says Corrado Coin, Sales and Project Planning at bsAutomatisierung. IPR has specialized in the development and manufacture of products for industrial robots for more than 25 years. In addition to a comprehensive product portfolio of pneumatic, electrical, and hydraulic components and applications the company also offers mobility solutions for assembly and handling technology, for loading and unloading units, and for paint applications using ceiling-mounted, wall-mounted and floor-mounted RTUs as well as RTUs with coaxial extensions. The modular systems of differing sizes extend the action radius of robots. Nowadays the intelligent utilization of existing resources is also an absolute must, so if the use of robots is part of planned automation solutions, it needs to make economic sense. “Integrating IPR’s robot transport units greatly improves the use of robots. Flexible system concepts can be realized with task-specific handling applications and corresponding software. In the meantime, such mobile robotics solutions are also financially beneficial for small and medium-size companies with not fully standardized tasks,” highlights Corrado Coin. RTUs from IPR are always modular and can be flexibly extended. The basic module has a length of two meters and a travel of one meter. The length is for the most part freely selectable. The robot can approach any number of different stations along the travel axis. Guide rails, form-fit connections and carriages with roller guides ensure precise movement. The carriage speed is a maximum three m/sec and the acceleration speed is up to four m/sec. To move heavy loads of up to 10 tons and reliably control the corresponding load torques, the aluminum manufacturer uses the extremely robust IP 400 RA RTU with a special profile rail/roller guidance system in their automated loading station. “The integrated automation solution of robotics and an RTU increases the action range of the loading station by 1,750 mm. With that, all load and position options can be realized reliably and safely during the material feed,” says Peter Jaeschke, Sales Manager at IPR. Helical gear racks and pinions provide the best possible precision and repeatability. The robust welding constructions and the integration of powerful drives and components ensure a long service life – even under the highest loads. Three-quarters of a year passed between the initial project inquiry in spring of last year and the final commissioning of the automated loading station. “If a highly specialized but rather small company would like to master such projects, they need to depend on reliable partners with the appropriate know-how and a high-quality product and service portfolio. The collaboration with IPR was very open, goal-oriented and went really smoothly,” summarizes Corrado Coin. The automation solution has been operating at the customer’ site without problems or breakdowns since the beginning of the year.